One of the greatest inventions of all time has to be self-stick adhesive tape. 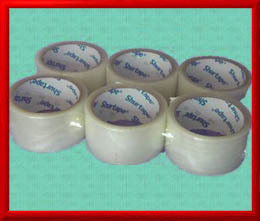 In the beginning it's uses were limited because both the adhesive and the tape were not too strong, but over time advances in material science made it possible to produce high strength tape with a high strength adhesive, so that today self stick tape now is now one of the pillars of the world of packaging. Nowhere is this more apparent than case sealing. Years ago corrugated cardboard cases were either glued or stapled shut because nothing else could match the holding power of these systems. Today hardly anybody does case stapling anymore, because the staples are very expensive. Hot glue case sealing is still popular, particularly in high volume automated production systems, because the hot glue systems integrate well with the automation. In small low volume production systems self-stick tape is now the king. To achieve uniformity and consistency with this type of package sealing method automatic case tapers were invented. These machines automatically apply the tape as the box is pulled through the machine by a friction conveyor below the box. The leading edge of the tape roll is located on a tang ahead of the box. As the box touches the tape the leading edge tacks to the top edge of the box. As the box moves forward it drags the tape off the reel and a series of pressure rollers tamp the tape down with a uniform pressure to create a tight seal. After the end of the box passes under the tape applicator head, the head drops down and a serrated knife comes out to cut the tape and make the machine ready for the next cycle. A company called Little David produced the machine you see above. They are very popular and thousands of these machines are in use throughout the world today.